(Newser) – President Trump was merely making a "rhetorical response" to criticism when he said he should have left three UCLA basketball players in a Chinese jail, according to White House press secretary Sarah Huckabee Sanders. 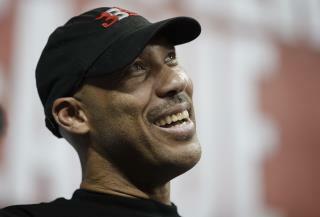 She said Monday that Trump was "happy to intervene" in the case and had been responding to statements from LaVar Ball, father of player LiAngelo Ball, who questioned how much Trump had helped, the Washington Post reports. "I think it was less about the players than the father of one of the Americans really seemed to have a problem with it," Sanders said. "Frankly, it didn't seem like the father wanted the president to intervene, which I think would have been a sad thing if he hadn't, most likely." Lesson learned white people...this is what you get when you try to help black people. Best to leave them to fend for themselves. Dump was just being an A-hole. When I heard Trump was pardoning turkeys today, I thought Don Jr. and Jared got indicted. I'll see myself out now.